1. MATERIAL: Steel, corrosion-resisting, 300 Series as specified in QQ-S-763 and FED-STD-66, Composition 304 or 316 or equal to or interchangeable with 16:18 or 18:8 chromium-nickel alloy steel. 2. PROTECTIVE COATING OR TREATMENT: Cleaned and descaled in accordance with ASTM A380-78. Black oxide coating in accordance with procurement specification when black oxide coating is required, the dash number shall be followed by a “B”). 3. 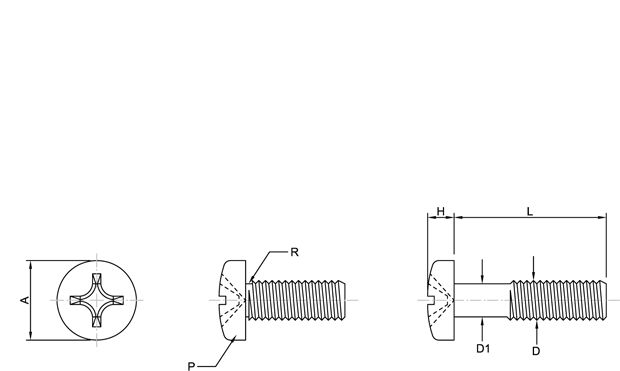 MAGNETIC PERMEABILITY: The screw shall meet the magnetic permeability requirements of the procurement specification. 4. THREADS: Threads shall be in accordance with FED-STD-H28/2. 5. RECESS: The recess shall be in accordance with MS9006. 6. PART NUMBER: The MS Part Number consists of the MS number plus the dash number and code letter if applicable (See Req. 2). Example:	MS51958-45; cleaned and descaled. MS51958-45B; black oxide coated. 1. All dimensions are in inches unless otherwise specified. 2. Referenced documents shall be of the issue in effect on date of invitations for bids, or request for proposal except that referenced adopted industry documents shall give the date of the issue adopted. 3. For design feature purposes, this standard takes precedence over procurement documents referenced herein. The screws covered by the dash numbers given in MS35217, MS35234, AN520 in part and AN526 in part, are cancelled/inactivated after the dates indicated on the documents. Use the dash numbers given in the preceding sheets. The cancelled screws cannot always replace the new screws and should be used until existing stocks are depleted. Use only the new screws for design and replacement. Replacement shall be in accordance with this table.